tfortesting | Testing make things perfect.. Ensure that the Application works correctly following a memory card insertion action when the Application is suspended and resumed. 3. Insert the memory card into the phone, and mount the card. 5. Unmount the memory card. The Application continues to operate as designed based on the Application specification and is not affected by the memory card insertion or mounting/unmounting. Ensure that the Application works correctly during a memory card insertion and removal. 2. Insert and remove the memory card. 3. Verify that Application works correctly. 1. The Application should work correctly following memory card insertion. 2. The Application should work correctly with memory card removed. Ensure that the Application with memory card functional screens works correctly with memory card inserted and removed. 2. Navigate to screen where Application works with memory card. 3. Insert the memory card. 4. Verify that Application works correctly. 5. Remove the memory card. 2. The Application should work correctly following memory card removal. Here, all the Downloaded apps will be listed. It will show the location of app whether its Downloaded on internal memory, SD Card or currently in Running status. 1. Verify how much memory space (internal/SD Card) occupied by app. b) Authorization means checking credential. b) Authentication means checking credential. 3. Why we do security testing? 4. Which methods/techniques are used for security testing? 9. Which symbol is used to test SQL injection? 10. What is the full form of XSS? Cookie is small bit of information stored in text file on user’s hard drive by web server. This information is later used by web browser to retrieve information from that machine. Generally cookie contains personalized user data or information that is used to communicate between different web pages. Cookies are nothing but the user’s identity and used to track where the user navigated throughout the web site pages. The communication between web browser and web server is stateless. For example if you are accessing domain http://www.example.com/1.html then web browser will simply query to example.com web server for the page 1.html. Next time if you type page as http://www.example.com/2.html then new request is send to example.com web server for sending 2.html page and web server don’t know anything about to whom the previous page 1.html served. What if you want the previous history of this user communication with the web server? You need to maintain the user state and interaction between web browser and web server somewhere. This is where cookie comes into picture. Cookies serve the purpose of maintaining the user interactions with web server. Find the folder on your PC where cookies are stored. Delete all of the existing cookies. In Internet Explorer, the cache files are stored in the same folder as the cookies. Clearing the browser cache in IE can make finding the cookies easier, but isn’t strictly necessary. Navigate through all of the major features and functions on the site to see where cookies are employed. Every time this dialog appears, record the cookie details and what action(s) cause the cookie to be created or modified. Then, click Yes to accept the cookie. Personally, I find it easier to accept the cookie, open the cookie file and copy/paste the cookie details into a “cookie log” with my observations for later analysis. Save this data, including the cookie names and contents, creating a log of cookie activity correlated to your activities on the website. A word of warning: some sites are highly active with cookies, setting or modifying them on every page you visit. Creating the cookie log on these types of sites will be time consuming and drive you to a certain level of insanity. Getting as much info as possible in advance about cookie activity from the developers is usually your best bet. The HTTP protocol used to exchange information files on the web is used to maintain the cookies. There are two types of HTTP protocol. Stateless HTTP and Stateful HTTP protocol. Stateless HTTP protocol does not keep any record of previously accessed web page history. While State full HTTP protocol do keep some history of previous web browser and web server interactions and this protocol is used by cookies to maintain the user interactions. When user visits the same page or domain later time this cookie is read from disk and used to identify the second visit of the same user on that domain. Expiration time is set while writing the cookie. This time is decided by the application that is going to use the cookie. Generally two types of cookies are written on user machine. 1) Session cookies: This cookie is active till the browser that invoked the cookie is open. When we close the browser this session cookie gets deleted. Some time session of say 20 minutes can be set to expire the cookie. 2) Persistent cookies: The cookies that are written permanently on user machine and lasts for months or years. Here the “Default User” can be replaced by the current user you logged in as. Like “Administrator”, or user name like “Vijay” etc. The cookie path can be easily found by navigating through the browser options. In Mozilla Firefox browser you can even see the cookies in browser options itself. Open the Mozila browser, click on Tools->Options->Privacy and then “Show cookies” button. On Mozilla Firefox browser when you open the page rediff.com or login to your rediffmail account, a cookie will get written on your Hard disk. To view this cookie simply click on “Show cookies” button mentioned on above path. Click on Rediff.com site under this cookie list. You can see different cookies written by rediff domain with different names. 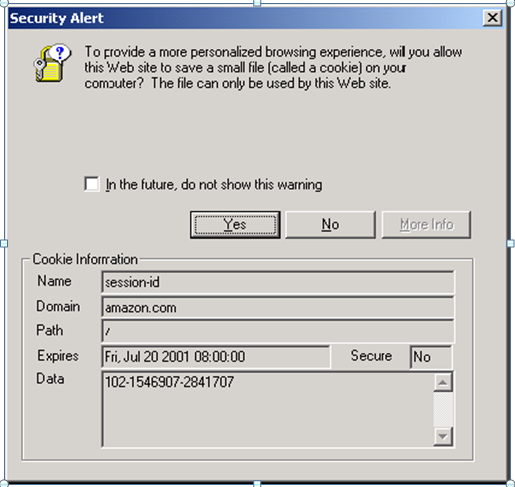 Since per-session cookies aren’t written to the hard drive, examining the cookie content can be done only through the actual Netscape prompt. .amazon.com is the domain this cookie is valid for. TRUE is a flag indicating whether or not all machines in the domain can access the cookie. / is the path the cookie is valid for. FALSE is a secure flag indicating whether or not a secure (encrypted) connection is needed to access the cookie. 994320128 is the UNIX expiration time of the cookie. session-id is the name of the variable stored by this cookie. 102-7224116-8052958 is the value of this variable. Cookies are used for maintaining online ordering system. Cookies remember what user wants to buy. What if user adds some products in their shopping cart and if due to some reason user don’t want to buy those products this time and closes the browser window? When next time same user visits the purchase page he can see all the products he added in shopping cart in his last visit. When user visits certain pages they are asked which pages they don’t want to visit or display. User options are get stored in cookie and till the user is online, those pages are not shown to him. To track number of unique visitors online at particular time. Cookies can track user sessions to particular domain using user ID and password. If you are writing too many cookies on every page navigation and if user has turned on option to warn before writing cookie, this could turn away user from your site. Some times users personal information is stored in cookies and if someone hack the cookie then hacker can get access to your personal information. Even corrupted cookies can be read by different domains and lead to security issues. Some sites may write and store your sensitive information in cookies, which should not be allowed due to privacy concerns. How do I enable cookie support in my browser? 1. Left Click the ‘Tools’ menu. 2. Left Click ‘Internet Options’. 3. Left Click ‘Privacy’ tab. 4. Left Click the ‘Sites’ button. 5. Type http://www.weighin.net into the top box. 6. Left Click the ‘Allow’ button. 7. Left Click the ‘Ok’ button. 8. Left Click the ‘Ok’ button. Select “Override automatic cookie handling” under the “Cookies” section in the Advanced Privacy Settings window. 4. Left Click ‘Exceptions’ button. 7. Left Click the ‘Close’ button. 2) If you have no option than saving sensitive data in cookie make sure data stored in cookie is stored in encrypted format. 5) Accepts/Reject some cookies: The best way to check web site functionality is, not to accept all cookies. If you are writing 10 cookies in your web application then randomly accept some cookies say accept 5 and reject 5 cookies. For executing this test case you can set browser options to prompt whenever cookie is being written to disk. On this prompt window you can either accept or reject cookie. Try to access major functionality of web site. See if pages are getting crashed or data is getting corrupted. 6) Delete cookie: Allow site to write the cookies and then close all browsers and manually delete all cookies for web site under test. Access the web pages and check the behavior of the pages. 7) Corrupt the cookies: Corrupting cookie is easy. You know where cookies are stored. Manually edit the cookie in notepad and change the parameters to some vague values. Like alter the cookie content, Name of the cookie or expiry date of the cookie and see the site functionality. In some cases corrupted cookies allow to read the data inside it for any other domain. This should not happen in case of your web site cookies. Note that the cookies written by one domain say rediff.com can’t be accessed by other domain say yahoo.com unless and until the cookies are corrupted and someone trying to hack the cookie data. 8 ) Checking the deletion of cookies from your web application page: Some times cookie written by domain say rediff.com may be deleted by same domain but by different page under that domain. This is the general case if you are testing some ‘action tracking’ web portal. Action tracking or purchase tracking pixel is placed on the action web page and when any action or purchase occurs by user the cookie written on disk get deleted to avoid multiple action logging from same cookie. Check if reaching to your action or purchase page deletes the cookie properly and no more invalid actions or purchase get logged from same user. 9) Cookie Testing on Multiple browsers: This is the important case to check if your web application page is writing the cookies properly on different browsers as intended and site works properly using these cookies. You can test your web application on Major used browsers like Internet explorer (Various versions), Mozilla Firefox, Netscape, Opera etc. 10) If your web application is using cookies to maintain the logging state of any user then log in to your web application using some username and password. In many cases you can see the logged in user ID parameter directly in browser address bar. Change this parameter to different value says if previous user ID is 100 then make it 101 and press enter. The proper access message should be displayed to user and user should not be able to see other users account.